The work in the context of FACTS4WORKERS at one of our industrial partners has been scientifically exploited. 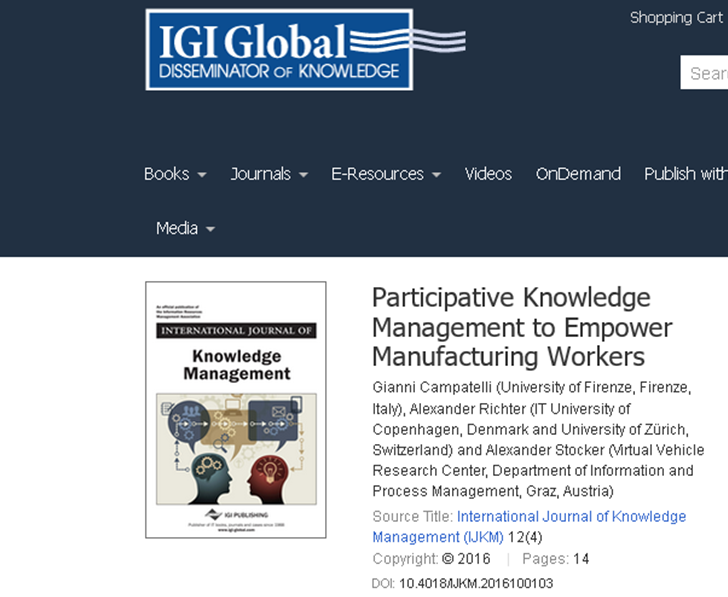 Gianni Campatelli (Università degli Studi di Firenze, Italy), Alexander Richter (University of Zurich, Switzerland) and Alexander Stocker (Virtual Vehicle Research Center, Austria) published at the International Journal of Knowledge Management (IJKM) the paper Participative Knowledge Management to Empower Manufacturing Workers. Due to the rapid technologic change, the authors see the role of manufacturing workers continuously changing: the increasing automation of manufacturing processes has reduced the amount of manual work, whereas the increasing complexity of manufacturing systems requires workers to build-up broader and deeper skills. In this paper, they suggest a participative knowledge management approach to empower manufacturing workers. Starting from a comprehensive empirical analysis of the existing work practices in a manufacturing company, the authors have developed and validated a knowledge management system prototype. The prototype is aimed for training, problem solving, and facilitating the discovery, acquisition, and sharing of manufacturing knowledge. The conducted evaluation of the prototype indicates that workers’ skills and level of work satisfaction will increase since the knowledge management system allows faster problem solving by finding better solutions for observed defects.